“If both of your shoes are shined, then your best foot will always be forward,” said Author Maryrose Wood. Haddonfield native Matthew Golia has done just that, as he is a finalist in a national contest for his shoe shine boxes. He is a finalist in the Martha Stewart American Made contest that celebrates and showcases American hand-crafted products. Golia is the founder and force behind American Shine Co. a maker of premier, hand-crafted shoe shine boxes, built right here in Haddonfield. The voting period of the contest is going on now. People can vote for Golia online to win the contest through midnight on Oct. 19. “It is a cool thing. We’re pretty proud making them ourselves. We have been Haddonfield residents all our lives, so we would love the support of the neighborhood,” Golia said. Growing up, Golia has always been a “shoe guy.” He always had shoes and dress shoes, which his dad Steven taught him to shine and take care of when he was young. For Christmas last year, Golia was given a shoe shine box, which he thought was nice and greatly appreciated. However, looking at it, he thought it could be even better. So he, along with his dad, started drawing prototypes until they found one they liked. “We have always been handy, doing everything around the house ourselves, working with our hands, going to the hardware store and everything that has to do with woodworking. This was like a first new project and challenge we decided to do,” Golia said. The box they came up with has a unique design where there are rails attached to the top of the box to thread the polish cloth through. 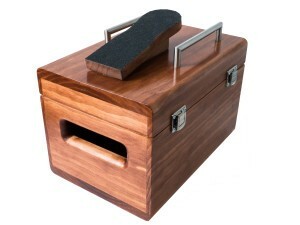 Normally, a shoe shine box holds shoe shining tools and has a rest on top of it for your foot, and nothing else. It offers a challenge for those who aren’t experienced shoe shiners. The rails guide the cloth to polish, clean and shine your shoes, allowing for an easier and steadier motion when pulling the cloth up and down against the shoes. That way, you can shine your shoes at home. 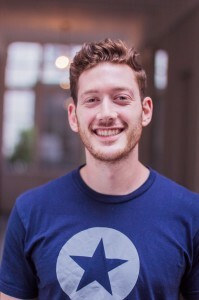 Golia’s project started as a hobby, but then he and his dad started to produce more and eventually made a website and company called American Shine Co., where they started getting orders, even from places all around the globe, such as Australia. Golia’s design is the only shoe shine box made with the railings. According to Golia, others use their boxes just for show. 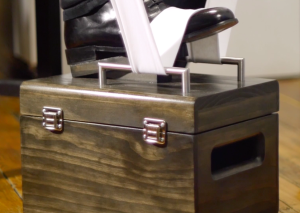 With this shoe shine box, there is a real functionality that others don’t have. All of the products are made in Haddonfield in their little workshop in his dad’s basement. Golia’s father found out about the Martha Stewart’s American Made contest and secretly entered the American Shine Co. into the competition. The company ended up making it to the top 50 in the style category. “My dad did all of it. He set it all up, which is pretty cool. I only found out about it when we got to be a finalist,” Golia said. The next step of the competition is based on voters. Whoever gets the most votes in their category gets $10,000 and a trip to New York. Golia feels it is important to support American-made products because they support local businesses and keep production and jobs in America. “We would love residents to vote for us as we are based in Haddonfield. It is exciting. We would love the help of the neighborhood,” Golia said. The voting period for the Martha Stewart’s American Made contest ends on Oct. 19. Register and vote on the website up to six times per day at www.marthastewart.com/americanmade/nominee/118966/style/american-shine-co.
To learn more about American Shine Co., visit www.americanshineco.com.